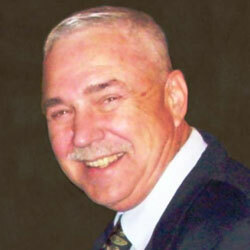 ASHEBORO, N.C. – John William “Bill” Varner, age 62, of Asheboro died Thursday, May 29, 2014 at Edgefield Hospital. Bill was a graduate of NC State University in 1972 and was a US Marine veteran but spent most of his professional career in the lumber business. He operated various lumber yards in and around Randolph County and worked in yards across the world. He was a history buff and was the author of “Gateway to the East,” a fictional narrative of his life. He is survived by his wife: Renee Strider Varner; son and his wife, John and Kathie Varner of Denton, NC; daughter: Emily Varner of Greensboro, NC; daughter and her husband, Catherine and David Britt of Asheboro, NC; 12 grandchildren,1 great grandchild; parents: Jack and Barbara Wade Varner; brother: Steve Varner; sister and her husband: Janet and Roger Burkhart; and sister: Lois Roberts all of Trinity, NC. The funeral will be Tuesday, June 3, 2014 at 6:00 PM at Pugh Funeral Home Chapel, 437 Sunset Avenue, Asheboro, NC. The family will receive friends following the funeral service until 9:00 PM at the funeral home. Burial will be at 6:00 PM Wednesday, June 4, 2014 in Mt. Zion United Methodist Church Cemetery. One Response to "John William “Bill” Varner"
Hey dad. It’s coming up on 2 months now. I just wanted to say “hello” and tell you how badly I miss you. I love you and think about you every day.